Arran was once a stronghold for the black grouse, with large numbers regularly recorded all over the Island. Even within living memory the black grouse was a familiar bird. Males or ‘blackcocks’ are very distinctive, with glossy blue-black plumage and red wattles, white bars on the wings, and curved black tail feathers. When displaying, these feathers are fanned, giving the tail a lyre shape and exposing the striking white under-tail coverts. The black grouse is well known for the early morning displays of the male. Blackcocks gather at selected locations known as 'leks', where they display to attract the greyhens, by strutting with their tails spread and heads held low. Leks are visited all year round, but the peak of activity is in spring when the females attend and mate with the males. These displays are memorable. 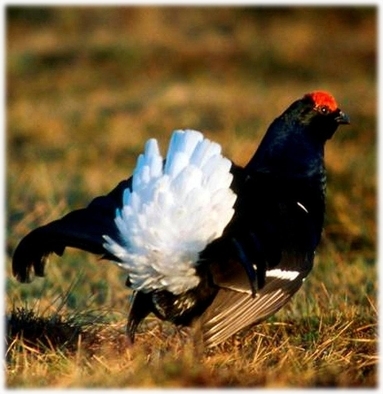 Historically the black grouse received special protection in Arran. In 1703 in the book “A Description of the Western Islands of Scotland” by M. Martin, it is stated that: “The blackcock is not allowed to be killed here without a permit; the transgressors are liable to a fine.” In the nineteenth century this was no longer the case with large numbers being shot. In 1956 J.A. Gibson in his publication “The Birds of the Island of Arran” wrote: “Until relatively recently it was a common breeding species and was well distributed throughout the island.” Numbers continued to fall, and the last record was a single female in High Glen Cloy on 18 February 2000. Several black grouse recovery projects have been initiated in the UK. The Arran Black Grouse Group is one of them. The group feels that the island has the right habitat and there are no foxes. The group is very much a local group with a wide range of representation including: conservationists, estate managers, farmers, foresters, and gamekeepers. This almost unique partnership of local people with the support of Scottish National Heritage and the National Trust for Scotland, is committed to black grouse reintroduction. A breeding programme is being established and is starting later this year when young birds are being brought onto the island. From this initial group, birds will be bred and, once a stock of breeding birds has been established, their chicks will be released. These released birds will be monitored and steps will be taken to ensure the success of the project. This will include ensuring that the habitat is maintained and where appropriate improved. Throughout the project, viewing sites for observation and educational purposes will be established. Although black grouse can still be shot, in season and with the land owner's permission, it is anticipated that none of the owners on Arran will permit black grouse to be hunted, such is the regard in which this species is held. Hopefully, the end result will be that Arran will be once again a stronghold for the black grouse, and this iconic bird will be regularly seen throughout the island.